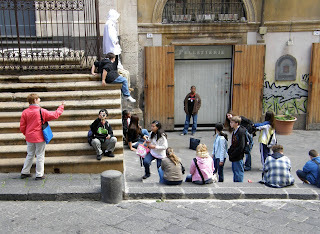 On Tuesday of this past week, my colleague and fellow AVID teacher Jan Sibayan and I took twenty-some 7th and 8th grade AVID students on a walking tour of Catania. This was Jan's plan, and she orchestrated the whole thing. It's quite fun to see things through their eyes instead of adult eyes. 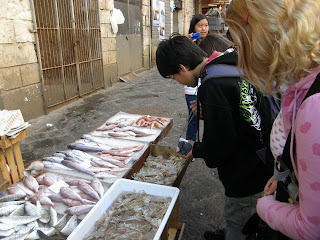 Some go to Catania every week for the market, and others had rarely been there (and only with school or on a tour). Everyone did see or do at least one new thing, though, even me! Best parts for them? Probably eating fresh strawberries in the market, eating lunch at one of the most beautiful McDonald's I've ever seen, stopping again and eating gelato, shopping for souvenirs, and just having fun with each other. They were quite well-behaved and patient through two churches, one Norman castle, two random courtyards, Roman ruins, two bars (cafes), the fish market and produce market, one Baroque palace, several piazzas, two Bellini monuments, two Cardinal Dusmet monuments, tons of St. Agatha stuff, and lots of Baroque architecture. That's a lot of walking around . . . and no one got lost! A new experience for me and many others was the opportunity to go down into the ruins of the old Roman ampitheater right downtown on Via Etnea. I'd seen it dozens of times from above but this was the first time I was down in it. It's obviously a whole new perspective . . . all the rooms and a few artifacts (pillars, bas reliefs) are up close and personal. 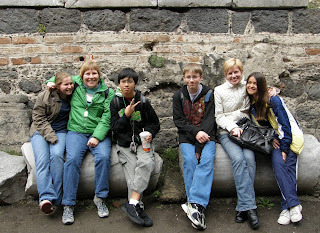 See AVID tutor Kathy Vary and I sitting on original columns with some of our students? Our junior chaperone and accompanying senior, Patrick, insisted that there used to be mazes of underground tunnels leading out of there . . . until an entire class of kids were lost forever. Then they closed them off. Fact or urban myth? It's hard to say in Sicily. We counted elephants. 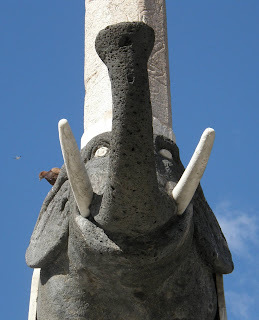 The elephant is the symbol of Catania, although it's not clear why. We saw a lot of them and I took a bunch of photos. The one to the right is the most visible and famous one in the Piazza Duomo. See the pigeon on his back? Jan and I are looking forward to next year and possibly adding more food stops, a kind of "eat your way through Catania" tour. Hmmm. Ummmm! Easter Bunny Comes to Sicily! 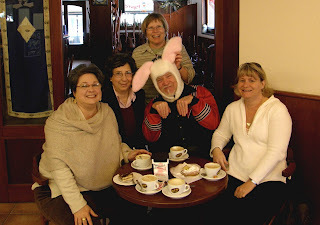 Guess who came to cappucino this morning at the Papaveri Papere Bar in Nicolosi? The Easter Bunny! Here he is with Lisa, Rose, me, and Kendra. And, yes, he drinks cappucino, too. 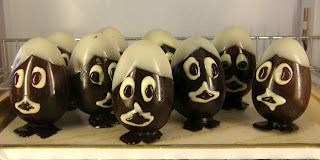 Check out the latest creation from the candy maker there today--chocolate egg people! Yesterday and again today, I saw something over Mt. 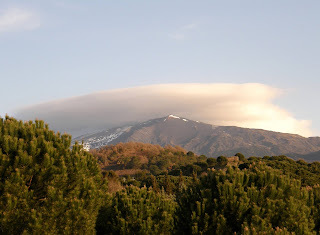 Etna that I had never seen, or perhaps noticed, before, a "flying saucer" cloud. The person who pointed it out to me said they only form over volcanoes. Well, it turns out it's not just volcanoes, but actually mountains, and the conditions have to be just right. I did a little googling and found out that this cloud is a lenticular cloud and that they are "relatively rare phenomena," which made me feel really lucky to have seen them two days in a row. Lenticular means "lens-like." It was one of my eighth-grade students who told me that! Smart kids! 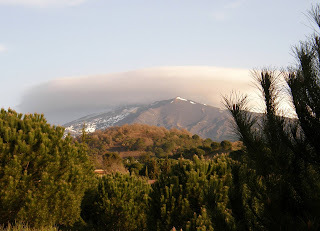 These clouds are formed above mountains (or volcanoes) as air is lifted to saturation over the top of mountains. They are "technically known as altocumulus standing lenticularis" and are stationary and usually aligned at right-angles to the wind direction. Here are a couple of photos I got this morning on my way to work. You know you've been in Sicily too long when . . . I got to thinking about this yesterday when I found myself wearing a down jacket, zipped-up, on a sunny day in 65 degree temperatures, and being completely comfortable! I've been Sicily too long! If we had this weather in Germany or Illinois I'd have been out in shorts, t-shirt, and sandals! Feel free to add more in COMMENTS, my American friends in Sicily!
. . . you find yourself passing on curve, if the road is wide enough.
. . . you're surprised when your luggage arrives in Catania on the flight you're actually on.
. . . stop signs and lights are only suggestions.
. . . you always bring your own paper and don't expect a toilet seat in a public restroom.
. . . you hit a killer pothole because you're afraid of hitting a scooter in your blindspot if you swerve to miss it.
. . . you no longer think "geep" are cute, just annoying for being on the road.
. . . you have horsemeat cravings.
. . . you no longer bother to wash your car or fix its dents, scratches, and scrapes.
. . . you are missing either a rear-view mirror, headlight, or taillight.
. . . you think Italian food IS the only cuisine worth eating and five courses is normal.
. . . you don't stand in lines but push to the front.
. . . you are not upset about a guy going the wrong way in a traffic circle; in fact, you think it's funny.
. . . you are an olive oil snob.
. . . you own at least one cat or dog you rescued from the street.
. . . you just laugh at GPSes and people who try to use them.
. . . you buy more in the market or on the street than in stores.
. . . you always wear sunglasses, even indoors, even at night.
. . . you know the Italian words for discount, sale, and going out of business.
. . . you always check to see if there is a strike or volcanic ash in the air before going to the airport.
. . . you have at least one good recipe for homemade limonello and have made it.
. . . you'll eat black spaghetti without a second thought.
. . . you don't expect to get anything done between one and four o'clock P.M.
. . . you can't move any of your furniture by yourself because it's all made from wrought iron and lava stone.
. . . you know the number for Telecom Italia assistance by heart. "I love this town immediately. There are three thousand years of history under my feet in Syracuse. It's a place of such ancient civilization that it makes Rome look like Dallas. Myth says that Daedalus flew here from Crete and that Hercules once slept here. Syracuse was a Greek colony that Thucydides called 'a city not in the least inferior to Athens itself.' Syracuse is the link between ancient Greece and ancient Rome. Many great playwrights and scientists of antiquity lived here. Plato thought it would be the ideal location for a utopian experiment where perhaps 'by some divine fate' rulers might become philosophers, and philosophers might become rulers. Historians say that rhetoric was invented in Syracuse, and also (and this is just a minor thing) plot. 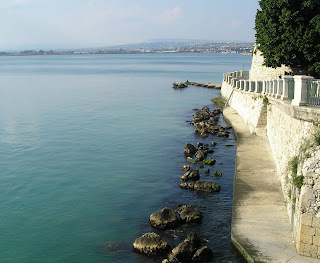 More of my photos of Siracusa here and here. I am finally getting around to reading the bestseller Eat, Pray, Love by Elizabeth Gilbert thanks to the glowing recommendations of many of my friends. It is very entertaining and fun to read--at least the Eat part, which is about the author "feeding her body," literally and figuratively, in Italy. She spends four months in Rome, with occasional side trips to sample the cuisines of Naples, Bologna, Parma, Venice, and finally, Sicily. This is not about travel or even food, but about pleasure. It's interesting that she saves Sicily for last: "And maybe it's in preparation for my trip to India that I decide to spend this last week traveling through Sicily--the most third-world section of Italy, and therefore not a bad place to go if you need to prepare yourself to experience extreme poverty. Or maybe I only want to go to Sicily because of what Goethe said: 'Without seeing Sicily one cannot get a clear idea of what Italy is.'" Not to steal her thunder, but how many times have I called Sicily a two-and-a-half world country? 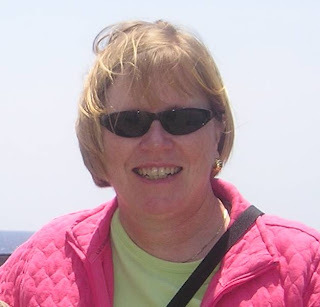 Many years ago, when I only got to travel to the schools in Italy and didn't live here, my friend Diana Patton at the Mediterranean Superintendent's Office in northern Italy let me in on a little secret. 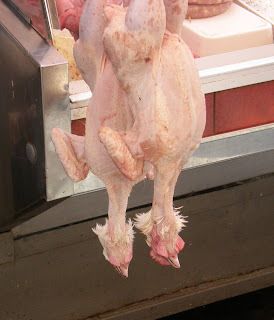 She said, "The further south you go, the better the food gets. 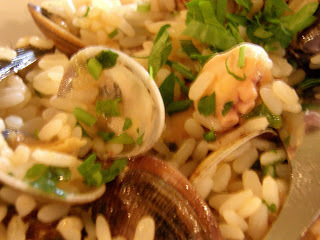 Naples and Sicily have the best." Although not everyone will agree, I happen to, and so do many other people, including Elizabeth Gilbert. 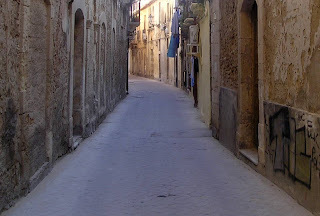 She finally gets to Taormina and gets a restaurant recommendation from a local policeman: " . . . within the space of twenty minutes I am busily eating the hands-down most amazing meal I've eaten yet in all of Italy. It's pasta, but a shape of pasta I've never before seen--big, fresh, sheets of pasta folded ravioli-like into the shape (if not exactly the size) of the pope's hat, stuffed with a hot, aromatic puree of crustaceans and octopus and squid, served tossed like a hot salad with fresh cockles and strips of julienned vegetables, all swimming in an olivey, oceany broth. Followed by the rabbit, stewed in thyme." 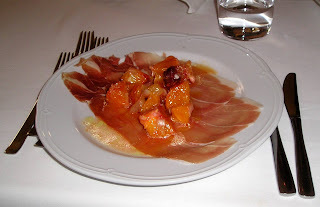 "But Syracuse, the next day, is even better. . . . the waiter brings me airy clouds of ricotta sprinkled with pistachio, bread chunks floating in aromatic oils, tiny plates of sliced meats and olives, a salad of chilled oranges tossed in a dressing of raw onion and parsley. This is before I even hear about the calamari house specialty." She writes about the poverty and ugliness of Sicily, especially how the Mafia has strangled the island, but comes to this conclusion: "Still, I will say that same thing which has helped generations of Sicilians hold their dignity has helped me begin to recover mine--namely, the idea that the appreciation of pleasure can be an anchor of one's humanity. 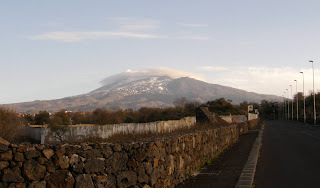 I believe this is what Goethe meant by saying that you have to come here, to Sicily, in order to understand Italy."